This situation is exacerbated considerably in my case. Living in a rural area has some great advantages, but it has its hazards to. In particular there is the danger of knowing a sprout farmer, which I indeed do. So for me not only is there the danger of copping a sprout grenade at a friend or relative’s house I’ve got two enormous stalks of green ghastliness sat in my pantry staring at me. I didn’t have any butter but I did have some extra virgin olive oil and some ginger paste, so I put a good glug of oil on a baking tray and mixed in half a teaspoon of ginger paste. 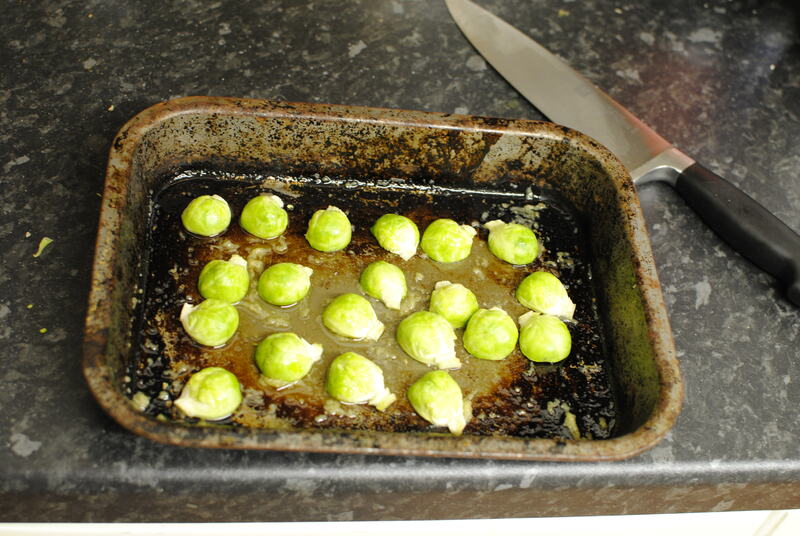 After taking the outer leaves off the sprouts I then halved them and put them cut-side-down on the baking tray, threw a pinch of salt over the top and chucked them in the (fan) oven at 180 Celsius for 10 minutes. As promised they were indeed lovely – the outer leaves a little crispy and slightly sweet and the inner full of ginger-laden flavour. Like many things the problem with sprouts is not the sprout itself, it’s the fact that many people have no idea how to cook them in a way that I like. This entry was posted in Life on 2014-01-02 by Tom Fosdick. I too love sprouts when they aren’t boiled – however mine are shown some crisped up bacon and a lots of black pepper. Even James will then eat them then. However, knowing your veggie status I’d recommend butter, apple and pepper. Parboil the blighters, then heat a frying pan, add butter and apples (peeled and diced), cook for about 3 minutes, add your sprouty lurkers, and lots of pepper and fry for another few minutes, until you start to see them crispy up on the edges. The only downside is no matter how they are cooked, if you are prone to the after effects, you’ll still require some time spent outdoors so as not to offend your loved ones!